Some attributes of Trompe L'oeil is the higher level of detail and attention to things like shadows. For the most part, the goal is to have people feel compelled to walk up and touch it after being told that it is painted. Sometimes, if done very well, people don't even understand that the image is painted at all, and in that case the painting can go relatively unnoticed by anyone who doesn't KNOW it has been painted. This comes in handy when you have an unsightly object, wall, or access box that you would like to make DISAPPEAR!! This is flat, painted directly on the door, can you tell? 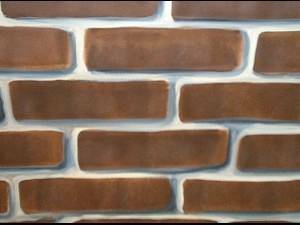 Want the look of brick or stone but not the mess and dust? It can be painted! I decided that until I can afford to have real or veneer stone applied to my own house, I could paint it! Though I don't consider the leaves here to be "trompe", the overall image is pretty "tricky" at first glance! How about an ancient doorway into a fantasy land, completely open to your individual and unique imagination? Not even the sky's the limit!